The multi-cuisine restaurant - with its wooden beams, rafters and paneled walls, and a sandstone fireplace, offers "the world at your table" served with a warm smile and a magnificent view of beautifully landscaped surroundings, overlooking the sabarmati river. The granite clad buffet-counter, crowned with a wrought-iron chandelier, is an appropriate centerpiece to this warm, yet casually elegant dining area. 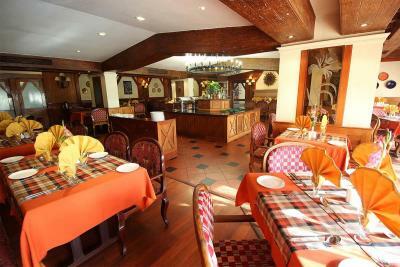 Open for breakfast, lunch and dinner, La Vista offers you an extensive a la carte choice as well as a buffet. Bring romance at candle light dinner in Ahmedabad. Enjoy buffet in Cama Hotel along with romance. The candle light dinner at Ahmedabad is way to include romance in your life.